Guild Bash Event is about summoning and slaying Huey Hops(also called The Bunny Monster). It is a guild event. In this event teamwork is must to achieve enough points in guild bash in order to get rewards like 'Summon Bonus' and 'Slayer Loot'. 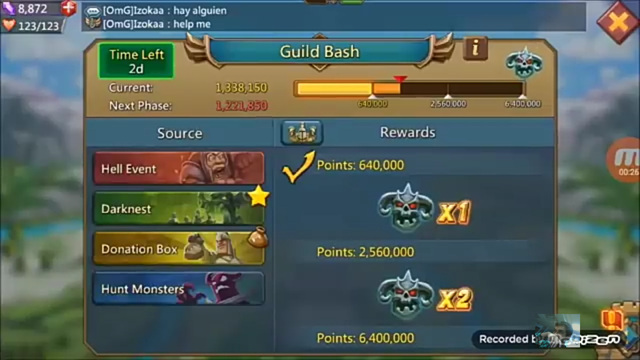 Monster Crest: Your guild requires enough points in Guild Bash to acquire Monster Crest. This monster crest is then required to summon the Bunny Monster. Summon: Once your guild have enough Monster Crest, the Rank 4 and Rank 5 in your guild can summon Huey Hops. Summon Bonus: All members will receive rewards once monster is summoned. You can unbox summon bonus in guild gifts. Slayer Loot: The Huey Hop will spawn near to the summoner. Afterwards any member or any guild can attack this monster. The one who will kill him will get the Slayer Loot. If you were not able to kill the monster, it will disappear after 3 hours. Tiers: It has three phases. You need to complete Tier1 to summon one monster, then you need to complete Tier2 to summon two monsters and you need to complete Tier3 to summon 3 monsters. This way a guild can summon 6 Monster in total. The Lord's Mobile has announced event date already. Wish you all the best. Disclaimer: The information is based on personal experience. It is advisable to utilise resources efficiently.